Are You Struggling to Sell Your Temecula Home? Today, we’re going to put our investor hats on! We are personally looking to buy three homes in the next thirty days. We’ll pay cash and you don’t have to worry about commission. Does your home have what we’re looking for? Many people in the Temecula area are well-aware of our Guaranteed Sale Program. Last year, we bought four of those homes from people, but this year, we have completely sold out of homes because inventory is so low! 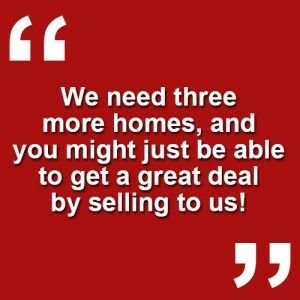 We need three more homes, and you might just be able to get a great deal by selling to us! If you have any questions about the value of your home, or if you’re interested in learning more about selling, give us a call or shoot us a quick email. We would love to help you get top dollar for your home in this incredibly hot market!